George Clooney is the main draw for this off-beat Cohen Bros-like film. Oh—and if you are longing for a reacquaintance with the ‘long-haired hippie guy’ Jeff Bridges character ‘The Dude’ from “The Big Lebowski,” you’ll probably enjoy this quirky film. Believe it or not, the film claims that the U. S. Army actually dabbled in the idea of psychological warfare as a means of combat in the early 80s. Weird techniques such as starring at goats until their hearts stopped beating, running through walls, telepathic powers and Jedi Warrior-type stuff. Crazy as it sounds, the entire film aims to enlighten us surrounding these methods through various flashbacks and modern day reporting. The film’s director is Grant Heslov (a writer/producer/business and close personal friend of Clooney). Co-stars include Ewan McGregor, a newspaper reporter named Bob Wilton, and Kevin Spacey who’s cast as another evil stereo-typed guy named Larry Hooper. 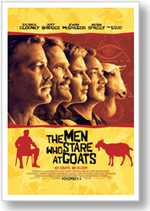 The beginning of the film states: “More of this is true than you would believe” and the ending declares: “No goats were harmed during the making of this film.” It’s based on a book of the same name by a British journalist named Jon Ronson; whose research substantiates the claim that a division of the U.S. military did in fact exist for the sole purpose of mental combat. The remainder of the tale is left to the creative and comical whims of the screenwriter Peter Straughan. Beginning in 1983 at Fort Bragg, we witness the ‘special psychic power’ unit of the U.S. Army as they train to use their minds for combat. McGregor is on assignment (in 2002) and listens intently to George Clooney (who he just happens to meet in Kuwait). An 80s tale unfolds regarding a certain Jedi Warrior named Bill Django who supposedly mastered these powers and is the leader of the unit. Bridges character is a hippie looking guy with a long braid down his back who instructs his soldiers from the New Earth Army Manual. George Clooney (Lynn Cassady) was part of the unit and he tells the tale with utmost seriousness. The tale is hardly believable although McGregor is intrigued. McGregor longs for that big story and to experience some action in the Mid-East. He decides to follow Cassady over the border into the warzone of Iraq and that’s when all the trouble starts to happen. Imagine running out of gas in a vast desert. What would you do? This and many more dangerous situations happen to McGregor. Believe it or not, he’s getting just what he longed for with a few twists and turns added. Most of the film is flashbacks to Fort Bragg and that ‘special psychic unit’ training camp. Each trip down memory lane produces one ridiculous training situation after another. Our protagonist in the story, Kevin Spacey, despises the Jedi Warrior Django and tries to sabotage his efforts at every turn. Much of the film is disjointed as the plot lines jump around and sometimes in circles. An LSD acid trip sequence appears out of nowhere as the morning breakfast eggs on the base are laced. We witness everyone tripping out, but how does this impact the story-line? I did enjoy seeing Clooney at several different stages in this film as he’s shown as a long-haired guy in the 70s who loves to dance. He dreams of opening a dance studio and we view him daydreaming about his plans often. Yes—this is a different kind of film. You will laugh, but I’m not convinced at times you’ll even know why.